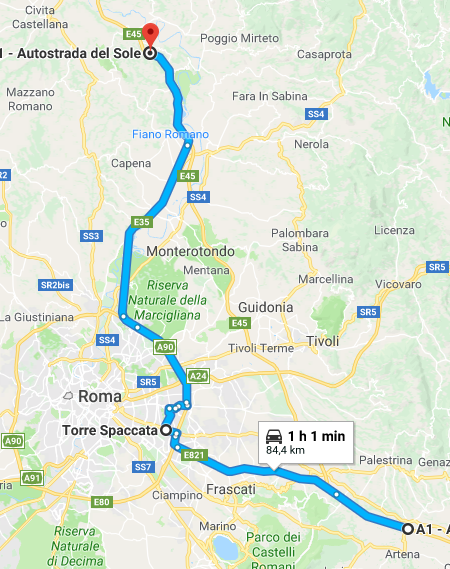 From your knowledge of Rome city, what are possible candidates for Blablacar pick up points for a northbound transit? I mean the driver has no business to stop for in the city but is traveling from the south (e.g. Naples) to north (e.g. Florence or Bologna) via Autoroute A1. A lot of passengers ask for the Termini station which is in the centre and requires a heavy deviation for the driver. I can see that Tiburtina railway station requires driver to detour via Autoroute A24 Rome city branch for approximately 10kms per branch. Drivers can choose Laurentina MB terminal station if they need to use the Inner Ring to proceed via SS1 Aurelia. With this question I would like to ask for candidate places to passenger pick up or drop when driver is only transiting. Requirements are that places have to cause least possible burden to driver and public transport (car sharing included) must be available to the passenger. I have been looking at underground lines but I found no place closer to the toll barriers. I hope there is a place in Rome that beats Tiburtina station in detour time, closer to the toll barrier. 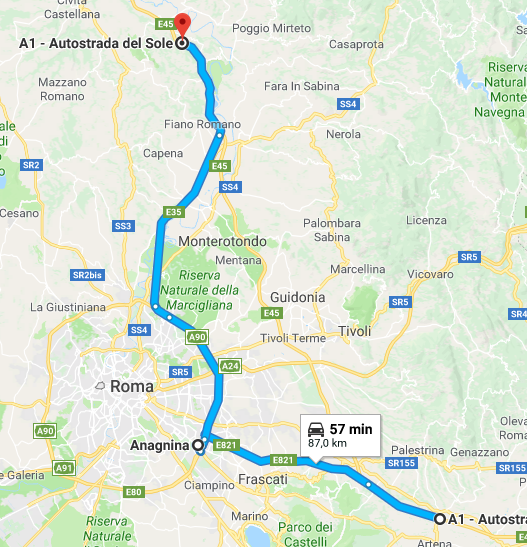 Actually, A1 passes east of Rome about 10 km out of the GRA (the outer highway ring), which itself circles Rome from quite outside. So, any point in the city proper already means quite a detour. As you pointed out, Tiburtina station is some of a least evil, since it is in the eastern part of Rome, at the point where the A24 enters the city. Have a look at the situation (but probably you've already done so) on Google Maps, at a scale where you see the GRA (A90) and the autoroute A1 (or E45). Another possibility might be out of Anagnina station of metro, line A, which is very close to the GRA itself, southeast of the city. Kudos to DaG for pointing out Anagnina which is great when you exit Rome South intersection and want to resume from A24/A1 intersection. On the same path I have found Torre Spaccata station which looks like to be served both by train (from Termini line) and Metro C.
Not the answer you're looking for? Browse other questions tagged driving rome car-pooling blablacar or ask your own question.